By now, it is quite a normal occurrence to have radiographs that give me no signs, yet the patient is in pain, like this woman I saw. Her dentist sent her to me, but only after a heavy dose of pain meds and some antibiotics. So by the time I saw her she could not indicate which tooth it was, and I had nothing from to go by from the periapical radiographs. Teeth #2-5 had no pain to percussion and the only tooth in the quadrant that felt cold was tooth #2, (#3-5 had no response to cold). I couldn’t assume that all three teeth were necrotic. She described her tooth story of having a few days of excruciating pain and then it started to subside. Her claim of having a painful episode like this one is usually a sign that a nerve has died somewhere, but I needed proof. 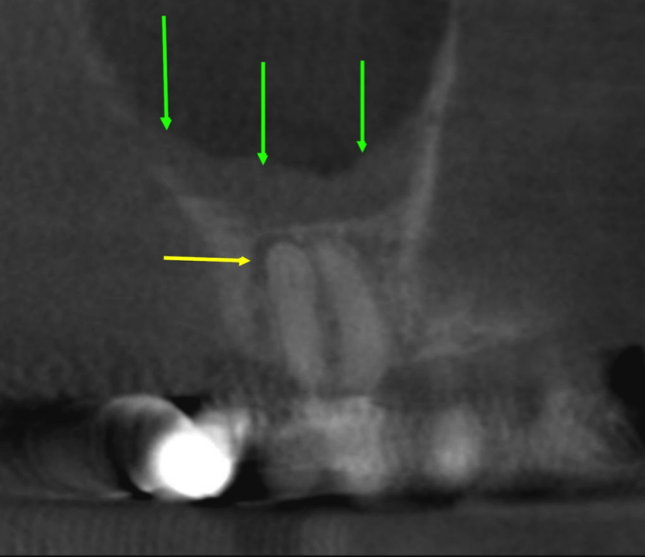 We know that periapical radiographs can be great, except when they’re not. What they show, or don’t show, combined with referred pain, can be a nightmare for diagnosing accurately. I’m frustrated, the patient is frustrated – and that’s when I employ the cone beam. I no longer have to wait for my patient’s pain to return and localize. I can see right through the buccal bone, without waiting for the bony breakdown of the cortical plate to occur. I can now treat her right away. For this patient, I took a cone beam to see if I could determine the etiology of her pain. I looked carefully through the planes, seeking any irregularities in the teeth and any resorption of bone. Everything looked normal and then I got to tooth #3. I could see some radiolucency around the disto-buccal and palatal roots. 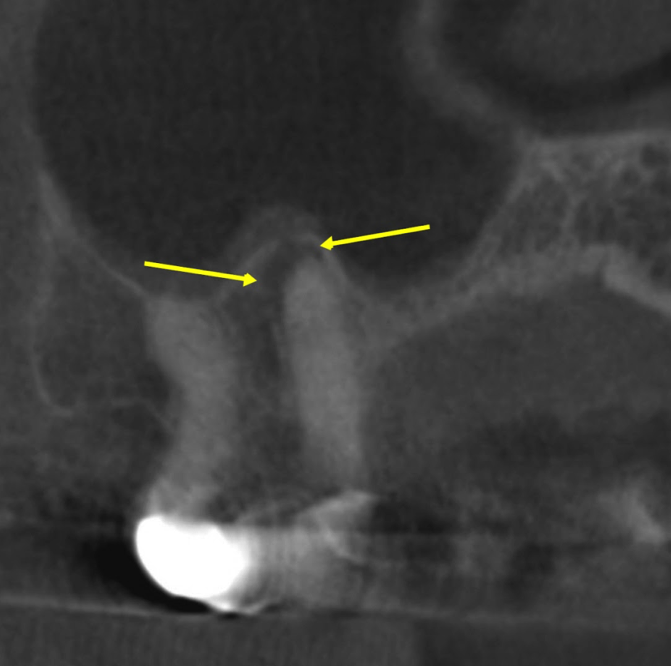 You can see the thickened sinus membrane in the next image as well (green arrows). This was the sign I needed that tooth #3 was necrotic. I gave my patient a confident diagnosis and told her that we could proceed with treatment right away. I am a very thorough tester, and this is an example of a case where the traditional methods just didn’t cut it. And you can’t blame your patient! I am embracing the technology of CBCT that helps me fill in the gaps. I know it is not fool proof (see my blog on cone beam and cracks), but it does help me diagnose cases more accurately every day, and most importantly, save teeth! 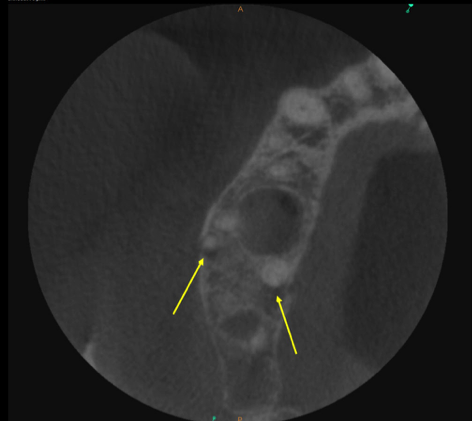 I’d love to hear about your experiences with CBCT – where it’s saved you, and where it’s failed you (let’s be real). Leave your comments below, and this will help other dentists in our group shorten the learning curve for this technology.